It is estimated that bees pollinate 75% of our flowering plants, many of which are crops. For the most part, bees are a beneficial insect with a strong influence in the citrus crops found throughout Southwest Riverside County, including the surrounding communities of Temecula, Murrieta, Hemet, Banning and everywhere in between. AmeriGuard Pest Defense understands and values the importance of bees and what they mean to our environment. Bees are social insects that operate under a caste system and live together in a hive. European honey bees make honey from the nectar of flowers. Mature bee colonies can contain anywhere from between 20,000-80,000 bees. A typical colony consists of the queen, worker bees (non-reproductive females) and male drones, which are responsible for mating with the queen. Male drones do not have stingers. Honey bees are not naturally aggressive and will only attack when defending their hive or if they feel threatened. Honey bees usually build nests in trees, although there are times when bees become a structural pest and invade attics, eaves, roofs, wall voids and even motorhomes. Honey bees swarm on average of once a year when the bee hive becomes too large. When this happens, a new queen emerges and leaves with a percentage of the worker bees to establish a new hive. During this phase, bees can temporarily cluster onto a structure, which can include a sidewalk, tree branch or outside of a residence or business. Most swarms will move on within 24-48 hours if left alone. 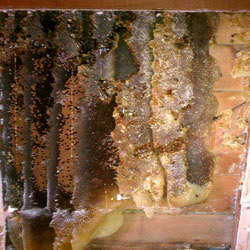 However, there are times when bees become a structural pest and construct permanent nests in attics, eaves, roofs, wall voids and even motorhomes. During these times bees can become a threat to homeowners and businesses, including small children and pets, necessitating a bee control service. AmeriGuard Pest Defense receives calls from a variety of businesses and homeowners requesting bee treatment services. Most bee control services can be quoted over the phone with no obligation. In some situations, we will need to perform an inspection prior to providing a firm price, but will be able to give you an estimate first. A licensed and trained bee control technician will perform a thorough inspection to identify where the bees are entering and where they are established in a structure as well as the type of bee treatment that will be most effective. If bees are located in an interior wall void or inside a roof, our trained in-house construction team may recommend opening the area for a thorough bee treatment service. 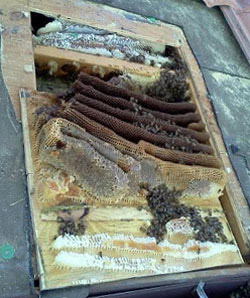 In most situations, the bee hive, bees and honey comb should be removed to avoid attracting additional pests. Our wood repair crew will complete any repairs necessary to restore your home to its original condition. AmeriGuard Pest Defense has specially trained and licensed bee treatment technicians experienced with providing complete bee control solutions for residential and commercial establishments. Our bee control technicians wear proper safety gear while treating for bee infestations. The risk of getting stung by bees during a bee service is great. Bees attack when they feel threatened and approaching a hive is enough to put bees into defense mode. It is safest to contact AmeriGuard Pest Defense for all of your bee control needs instead of attempting to eradicate a bee hive on your own. If you are concerned with an established or emerging bee problem that is causing unsafe conditions and damage, contact your local bee control experts at AmeriGuard Pest Defense for a free estimate or to schedule an bee service today by calling (951) 652-0505.